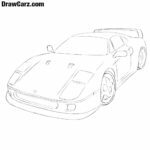 Now the team of drawcarz.com will tell you in detail how to draw a Ferrari easy. 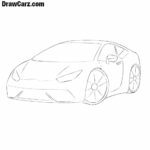 As in all tutorials on drawcarz.com, we will design a Ferrari from the side. 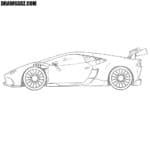 We will try to make this lesson as simple as possible so that any of our readers can depict this cool and fast supercar. To make it easier to sketch a Ferrari with a pencil, you must first outline the skeleton of geometric shapes, which we will then clothe in streamlined shapes. To this Ferrari template we will add the most basic details. Starting from the bumper, we design the headlamp, windows, mirror and two circle wheels. On the front of the sports car depicture the headlamps, hood (or bonnet) and bumper lines. Here you can start using either darker pencils or a marker. With a few light and confident movements we depict the flowing roof of the Ferrari. Note that the roof of the supercar should be very flat. The roof of this supercar very smoothly flows into the back. Here we draw the neat headlights and a fairly massive rear bumper. 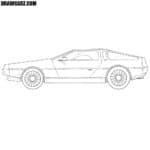 This part of the guide on how to depict a Ferrari will be very difficult, because here we will depict the door and all the design lines on the side of the sports car. This stage of the instruction about Ferrari will be even harder than the previous one, because here we will depicture the wheels and rims. Be especially careful, because all lines should be clear and smooth. To make the Ferrari more voluminous, let’s add the shadows. They should be drawn using hatching, as the artists of the DC site did in the example below. Today we showed how to draw a Ferrari – a truly legendary car that captured the hearts of millions of people around the world. The design and power of this car conquered our artists and editors, even though we like Lamborghini cars more. But as you already understood, we love sports cars and supercars very much, and we are going to design a huge number of similar super cars. The models of the Ferrari are quite different from other brands. Ferrari has distinctive features that create the appearance of the entire brand and catch the eye, even those who do not understand cars. Using the recommendations from this guide, you can draw other Ferrari variants, such as a Ferrari 488 Spider. Any car will look more beautiful if it is painted with colored pencils. Also you can depict the road and the landscape surrounding the car, then your Ferrari sketch will be a real picture. By the way, we are going to create sections dedicated not only to cars. In these sections on DrawCarz.com will be published lessons about motorcycles, airplanes and other vehicles.